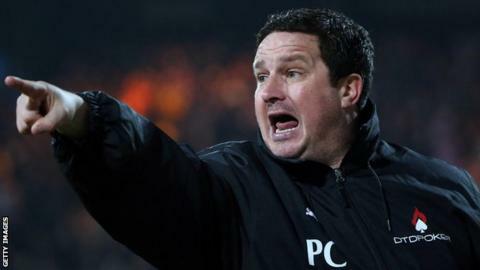 Torquay United boss Paul Cox is delighted with his "disengaged" squad after picking up six points from their first three National League games. The Gulls have made 14 summer signings, with 11 of them making debuts in their opening day win over Macclesfield. "It's like a disengaged 11 - I pulled them from everywhere, from every reserve side and free transfer that I could find," Cox told BBC Radio Devon. "But we're putting them together and I'm proud of them." It has been a rollercoaster few months for the Devon club, who were taken over in June after a period of off-field uncertainty. Former Mansfield manager Cox took charge at Plainmoor five days after the change in ownership, and admits he is surprised at how well his new team have coped. "I never normally start the season well. The wife said to me before the season started 'are you going to have a good start?' - and then she looked at our first 10 fixtures and said 'probably not," he said. Of Torquay's 14 new faces, 11 were free transfers and three loan deals, and defender Jamie Richards is the only one not to make an appearance so far. Despite the turnover, assistant boss John Ramshaw confirmed they are 'actively looking' for more signings. Cox's side host Woking on Tuesday night before a trip to Grimsby on Saturday. "You look at the next seven fixtures we've got and they're all going to be tough," the 43-year-old added. "I just think there's something building in this group, they're getting mentally stronger and they're understanding their roles better."